As usual this report is written as progress is made so there will be times when my original ideas change or develop. I blame Alan Gibson and his tantalising adverts for LMS locomotives in S Scale. They were advertised as "etchings only" and, for a long time, I felt they were completely beyond my level of expertise. There were no boilers or fireboxes and the level of complexity really deterred me. However, times change. When Alan sold his business I discussed with him the possibility of purchasing some of his easier LMS loco kits; the ones with parallel boilers, like the Patriot and Crab. One thing led to another and, before I knew it, I was the owner of all of Alan's built S Scale locomotives, as well as his remaining collection of LMS loco, wagon and carriage kits. Meanwhile I'd succeeded in building the Patriot (see the separate page about this) and a partial rebuild of Alan's 8F followed (click here for details of that). As a result I'd now got several locomotives that could operate a British Railways era layout - 3F and 4F 0-6-0s, a 3F 0-6-0T, a Fairburn 2-6-4T, a Patriot and the 8F. Initial thoughts were to use Halifax Midland to run these on but, unfortunately, there's an insuperable problem. The platforms on Halifax are too short to hold three LMS coaches and a locomotive. 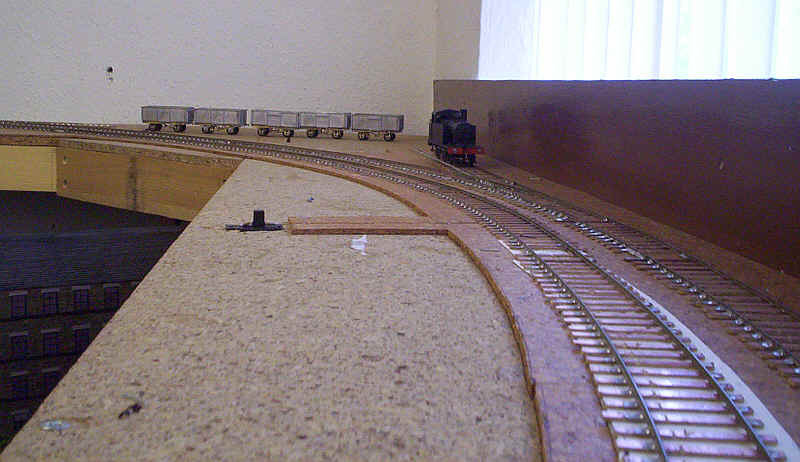 Various pipe-dreams followed, including replacing my 4mm scale loft layout with a mainline S Scale one. 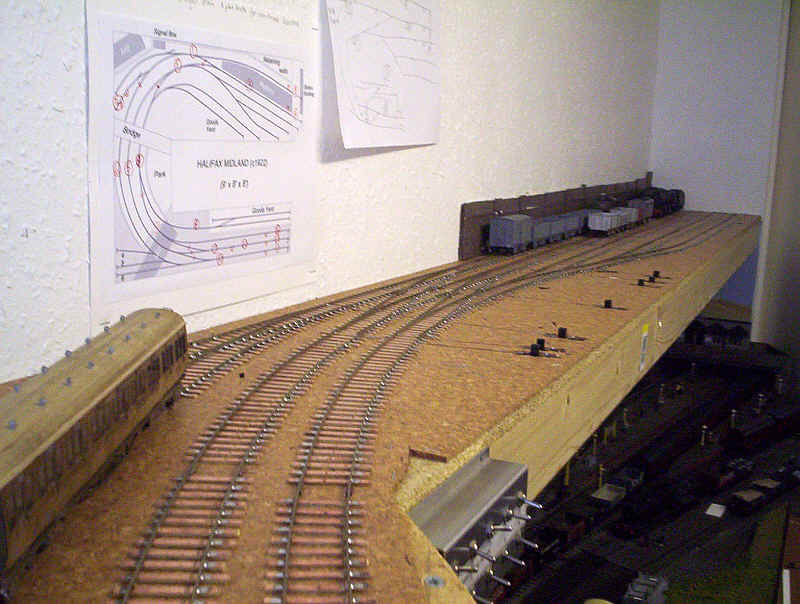 However, my recurring back problems really rule out building another layout from scratch. In any case, I think that to embark upon a large completely scratch built layout, whilst still teaching full time, would mean progress would be extremely slow. Finally, I came up with a compromise. 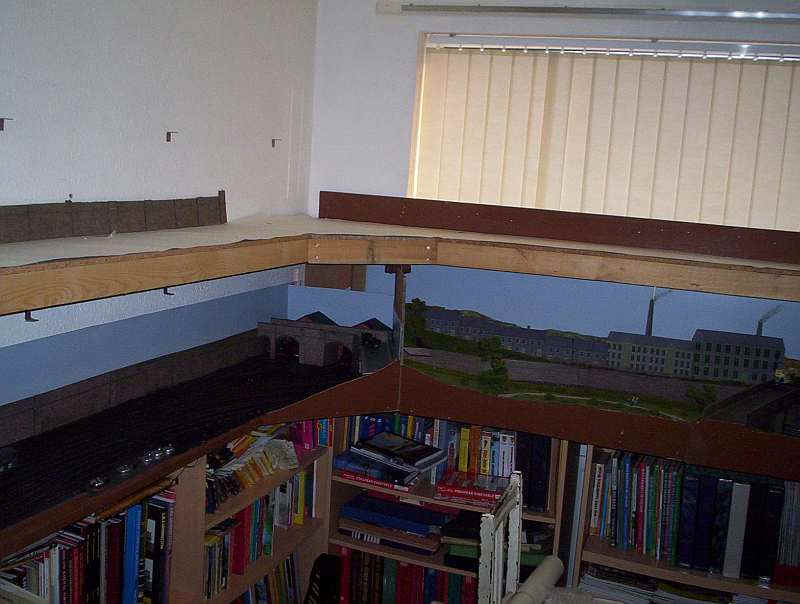 I'd double deck the layout in the small spare room where Halifax is. There wouldn't be any station so the basic concept would reflect this. On one side of the room there would be a series of sidings for holding carriages - either 3 or 4 car rakes - and some freight sorting sidings. On the other side of the room there would be a two road fiddle yard hidden behind retaining walls as well as a small locomotive depot. 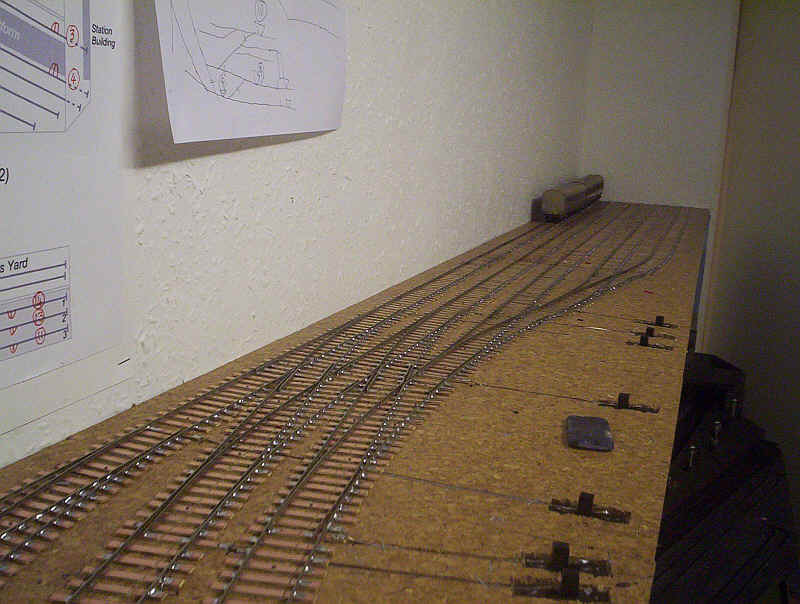 Various sidings will be squeezed into the corners and the emphasis will be on operation. The baseboards will be narrow; generally no wider than 12", whilst the scenery will be yet more retaining walls and industrial back scenes. In truth it will be, rather like Halifax Midland, a "model railway", rather than a model of a railway, and will really just be somewhere to run the models I build. The operational concept is that these are carriage sidings/ sorting sidings on the edge of a Yorkshire town. A double track line leaves the sidings and curves around the room to disappear into a tunnel leading to the main station. Quite what I'm going to call the layout has yet to be decided. any suggestions are most welcome. Passenger train operation will be similar to that found on the Lancashire and Yorkshire Calder Valley line in steam days, where 3 or 4 coach portions from Leeds and Bradford were combined or split at the real Halifax or Low Moor. This gives the excuse for short rakes of coaches and big locomotives like Class 5s, Jubilees and Patriots. Various 2-6-2Ts and 2-6-4Ts will power the suburban services. Freight trains will arrive behind large locos such as Class 5s and 8Fs and be shunted and dispatched to "off stage" local factories. There will also be an "on stage" small coal yard giving the excuse for a train of 16ton mineral wagons. To accommodate all these possible locomotives it's clearly necessary to build in plenty of storage space on the layout for locomotives; the shed area will therefore be able to house up to six tender locomotives. With the 0-6-0T housed in its siding and probably another three locomotives in the storage area or the carriage sidings/ sorting sidings it should be possible to have about ten locomotives on the layout at the same time. 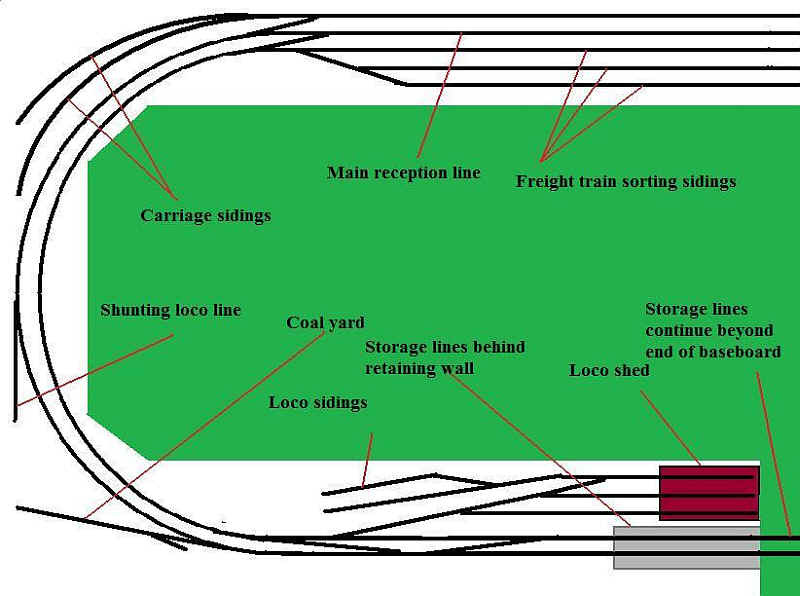 The layout has been drawn out full size and will have a minimum radius of 48" to suit the larger locomotives. 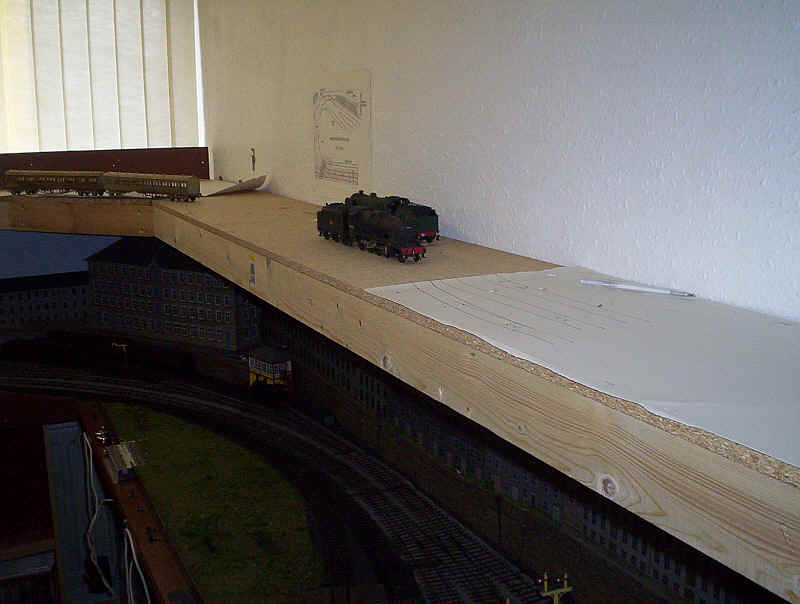 The baseboards are now complete and are suspended from the walls of the room without any obstruction of Halifax Midland underneath it. The photos below gives an idea of how the baseboards fit into the room. 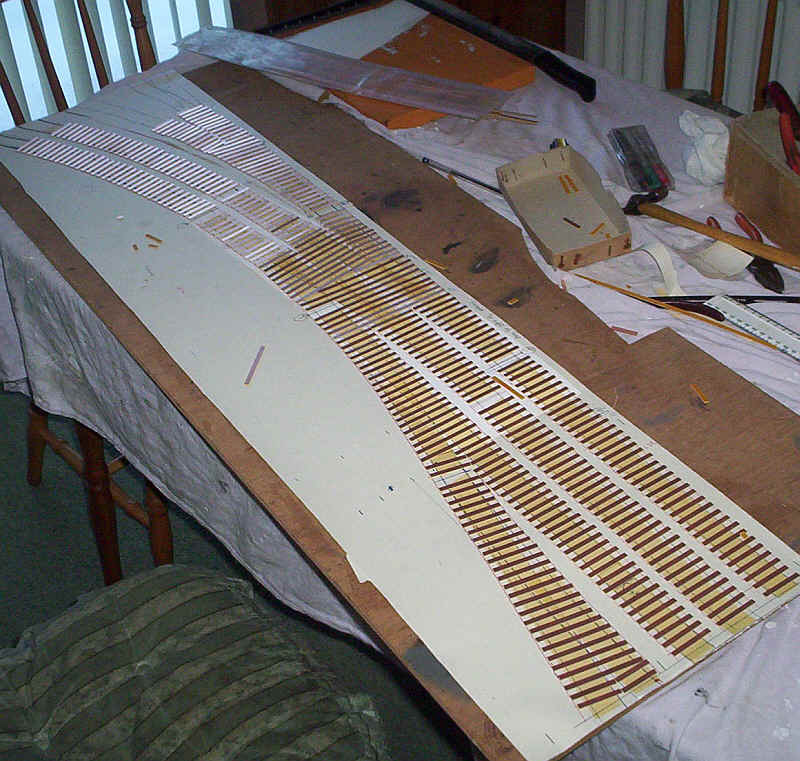 Having drawn the track plan out full size on lining paper the complex of point-work at the entrance to the carriage sidings/ sorting sidings were transferred to a board to allow construction to start. 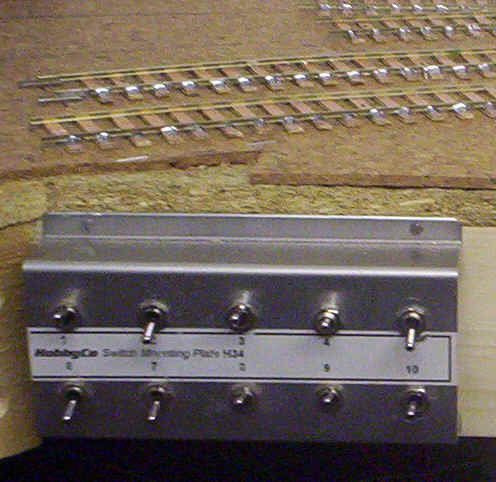 Here the copper-clad paxolin sleeper strip is in place ready for soldering work to start. 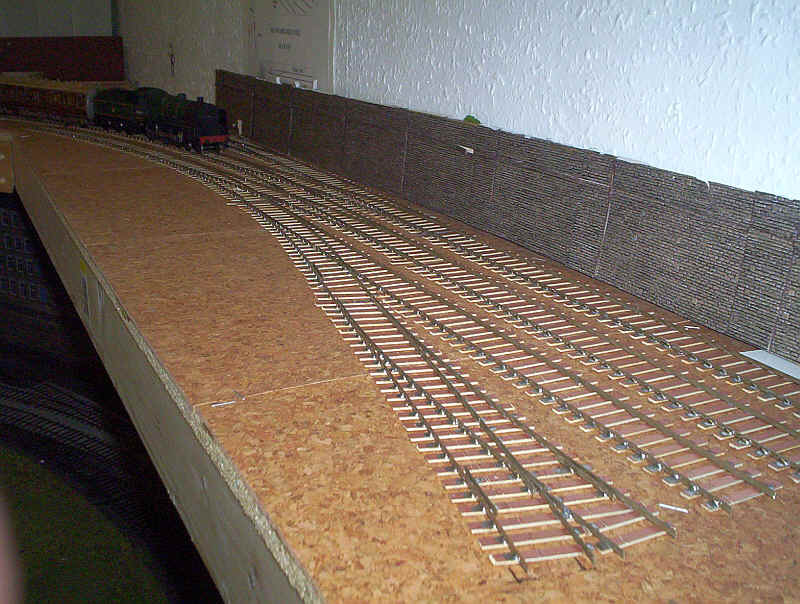 Here the first section of track is laid temporarily on the baseboard. There now followed a period of some uncertainty about whether this project was one I wished to proceed with but, eventually, I pulled myself together and decided to press on! The next task was to install the point complex at the entrance to the carriage and sorting sidings. I decided to use the tried and trusted method of point operation using double pole, double throw slide switches (purchased in bulk from Maplins). I've used a slightly different method of mounting these, which gives a neater appearance. A rectangular hole was cut in the cork and a series of small holes was drilled around the edge of the hole for the switch. These were then connected by wiggling the drill slightly and then tapping out the small piece of chipboard. The operating wire and plastic tube come from Model Signal Engineering. The wire passes through the switch knob and small pieces of brass tube on either side of the knob to control the amount of throw of the point blade. It's a relatively easy and neat way to change both the crossing polarity and the blades. The track was glued in place using PVA adhesive spread sparingly along the back of the sleepers and then held in place with fine black pins. After the inevitable short circuits were sorted out the track appears to function well. Using the larger profile rail (code 95) certainly improves the appearance of the track, which looks less spidery than that on Halifax Midland. The control panel is minimalist in the extreme. 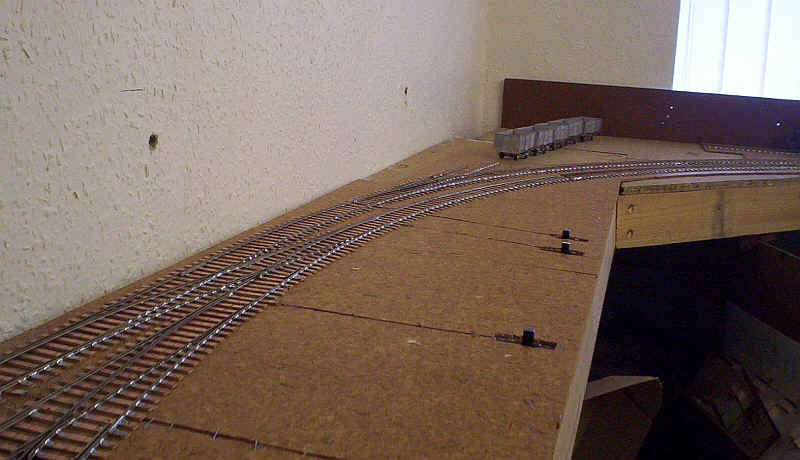 Only ten switches will be needed for the main layout with some locally situated ones for the locomotive shed isolation sections. Track construction has continued apace and this is the state of the new layout on the first day of February 2010. 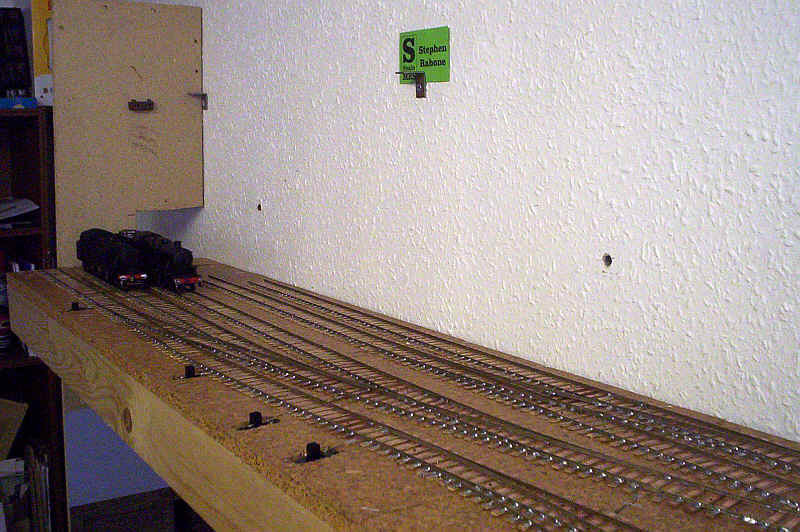 The five straight roads that form part of the carriage sidings/ sorting sidings are complete and wired up. I have to admit it looks quite good although, of course, I'd really like another 2 or 3 feet in length...... behind the camera the double track is already laid curving around the end of the layout. It's even possible to start running trains. The double track curves round the end of the room. On the left a suburban coach is standing on the site of one of the two carriage sidings. Travelling further around the curve, the shunting loco siding can be seen with a MR 3F 0-6-0T in place. Beyond can be seen some BR 16T mineral wagons on the site of the future small coal yard that will fill this corner. ...be seen in these two photos. These will eventually continue through the hole in the piece of timber seen at the end of the baseboard. The loco servicing area will have space for about seven locomotives when the track is finished. Fortunately, the pains diminished and sensations gradually returned to my fingers, although at the time of writing, three months after the problem started things are still not back to normal. Three months on sick leave sounds like modelling heaven but, in this case, it was a time of frustration eased only by my other passion of hill-walking. Fortunately, numb fingers don't affect the legs! Eventually, in June, I was advised to start to try to do more with my hand. The result has been that I've started the construction of a large number of etched and white metal wagons. These don't require the dexterity needed for a locomotive but at least allow some progress. 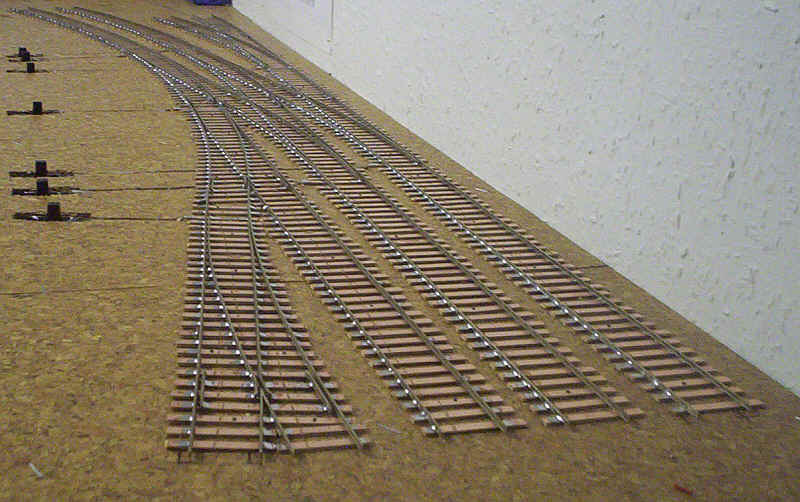 Quite when the rest of the track will be built, laid and ballasted depends on medical progress. Every so often in life reality breaks through our model making daydreams. I had one of those moments a few months ago when I realised that model making had become a chore. It was something that I was doing almost mechanically and without my usual passion for the task in hand. Over the last few months the problem with my right hand has meant that model making has been less enjoyable and more difficult than in the past. Then it struck me - I no longer wanted to build all that complex rolling stock and locomotives for my embryonic London Midland layout. I've had doubts about it for some time, particularly to do with the lack of space, but now there is another factor. I doubt I will have the patience (and possibly not even the dexterity) to build models with complex valve gear such as found on former LMS locomotives. Time for a rethink. Well, I've had plenty of time to think over the last few months on sick leave!! The upshot was the decision to dispose of all my S Scale LMS models and concentrate solely on the Midland Railway, There are several advantages to this. Firstly, the rolling stock is significantly smaller and thus looks less out of place in the small area I have for the layouts. The second is the obvious one of much simpler mechanisms. A third factor was that I'd found that almost all the models I was building were kits and, as I'd really enjoyed the scratch building I'd done for my Midland project, I thought perhaps it was time to re-align my model making. The thought of building coaches and wagons from plastic or card, rather than brass or white metal, appeals tremendously. My initial thoughts were to simply use the new layout as an "overflow" for Halifax Midland but I've had considerable reservations about doing this since one of my doctors nodded his head when I mentioned that working on the higher baseboards of the layout might have contributed to my injury. So in one of those cathartic moments, I decided to demolish the top layout and consign it all to the local tip. Thus ended six month's work but, on the other hand, I can now see Halifax Midland again properly and ideas are forming on how to make it a better layout. British Railways London Midland Region is dead, long live the Midland Railway!! In the meantime the models and kits I'd collected or constructed are wending their way to new owners around the world.